In the report, Smart Speaker User Survey - Global Results, nearly half (49%) of users said that they could not imagine living without a smart speaker, and nearly two thirds (65%) said that they had greatly improved the way they use technology at home. BOSTON--(BUSINESS WIRE)--Smart speakers like the Amazon Echo and Google Home have already had a strong influence on the lives of people who use them, according to new research from Strategy Analytics . In the report, Smart Speaker User Survey - Global Results , nearly half (49%) of users said that they could not imagine living without a smart speaker, and nearly two thirds (65%) said that they had greatly improved the way they use technology at home. 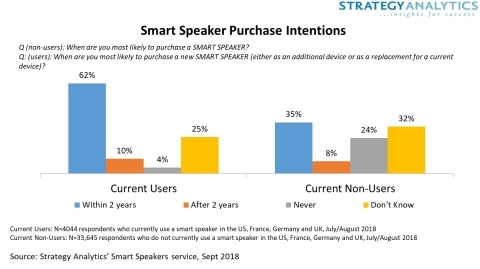 Even more people (70%) thought that smart speakers were much more useful than they had expected, but at the same time, 63% remain concerned that voice-controlled devices might record sounds and conversations without consent. 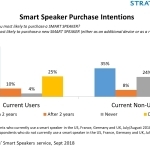 The survey was fielded online with 4013 users of smart speakers in July and August 2018 in the US, France, Germany and the UK. Strategy Analytics research predicts that global demand for smart speakers will reach 71.6 million units in 2018, an annual increase of 115%.